I'm really excited to share with you that I'm a guest poster over at The Nourished Life! I've been sharing some great DIY bath and beauty recipes and a few healthy food recipes over there once a week. I'd love it if you'd go over and check out my posts, and I think you'll love her blog. She blogs about natural care and self-care, which is close to what I blog about here. I'll try to post a recap of my posts here every Saturday so you don't miss a post. I post new recipes there that aren't found on my blog, and I don't want you to miss out! 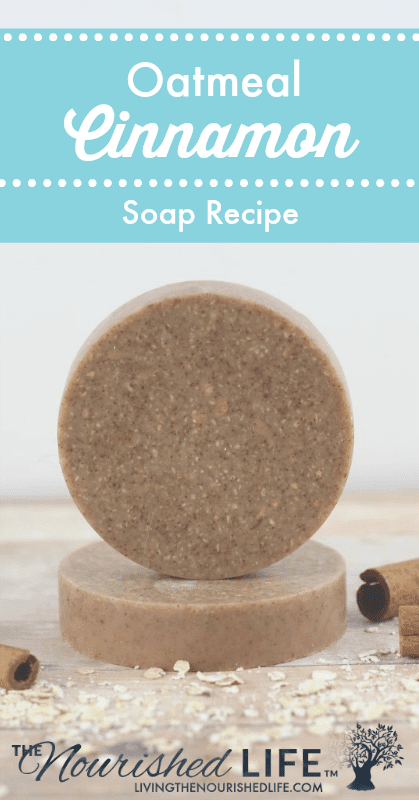 Last week, I published an oatmeal cinnamon soap recipe. This easy melt and pour recipe takes just 10 minutes to make. I used oatmeal for its skin-loving properties, especially for irritated skin. The cinnamon is a great fall scent. Be sure to go to The Nourished Life to check it out. If you like easy soap recipes, be sure to check out my pumpkin spice rebatched soap recipe and my pumpkin spice latte melt and pour recipe.